Where: Bounded by 4th Avenue and Smith Street, Butler Avenue, past 9th Street. What's nearby? Park Slope, Carroll Gardens, Boerum Hill. Transportation: The Union Street N/R subways and Smith Street F trains. Street smarts: Gowanus isn't particularly dangerous, but it can be desolate at night. Lodging: A number of national brand name hotels have opened in Gowanus including the boutique hotel, Hotel Le Bleu. Airbnb is also a popular option. Gowanus, a light industrial swath of Brooklyn centered around the (potentially, eventually clean) Gowanus Canal, is picturesque, with a gritty history dating to the mid 1800s. Today, the neighborhood offers the promise of waterfront property, water-refracted light, old warehouses and factory buildings with amazing space that are full of potential for revitalization. And, because New York City is a real-estate town, Gowanus has a great location: it's near decent public transportation to Manhattan, is accessible to various highways, is nestled next to the desirable brownstone neighborhoods of Boerum Hill, Carroll Gardens, Cobble Hill and Park Slope, and isn't far from the Downtown Brooklyn Cultural District. Since about 2000, Gowanus has been morphing into one of Brooklyn's popular yet off-the-beaten-track hubs for artists, photographers, DIYers, music venues, hipsters and cultural entrepreneurs. The reinvention of Gowanus into a hip, arty enclave hasn't happened overnight; some artists moved here as early as the 1970s. Lately, spurred by such groups as the Southwest Brooklyn Industrial Development Corporation a critical mass of new mom-and-pop businesses are changing the ambiance of the neighborhood. Little Venice it's not: there are no gondolas or waterside cafes. Yet. Why? Because the Gowanus Canal is polluted, an environmental disaster that was 135 years in the making. The Gowanus Canal is a Superfund site (though an actual dolphin, albeit a sick one, once swam up the canal -- before expiring). The target date for the cleanup by the federal EPA is around 2022. The final cleanup plan is expected in the coming years. Monte's Italian Restaurant: A vestige of its former self, but one of the oldest restaurants in the area. Four & Twenty Blackbirds, 439 3rd Avenue (between 7th Street & 6th Street). They have amazing pies. Runner and Stone Cafe, 285 3rd Avenue for breakfast, lunch, dinner, drinks. 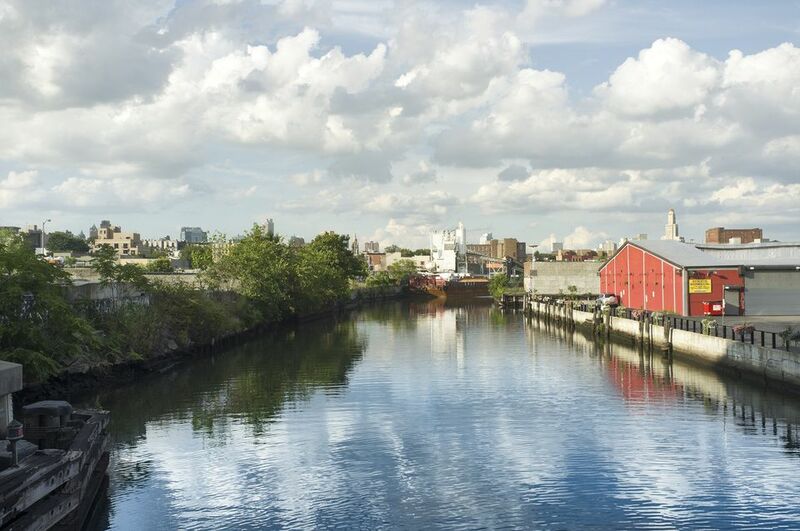 Take a walk over the Gowanus Canal itself. Go to a concert, performance, comedy or event at these Gowanus Venues: Bell House and Littlefield. Check out the Carroll Street Bridge. It's a landmark built in 1899 and is one of just four retractile bridges in the US. Visit local galleries during the annual autumn Gowanus Open Studio Tours, organized by Arts Gowanus. Book a boat ride in the Gowanus with Gowanus Dredgers. Participate in a collaborative bike build or take a free bike maintenance class at 718 Cyclery. Check out some of the cool buildings here, including the renovated 1885 Old American Can Factory, now housing painting studios, film production, design, and publishing businesses. Also the Gowanus Arts Building at 295 Douglass Street (between Third and Fourth Avenues) which has long been home to dance studios. At 339 Douglas, you can also find the home of Groundswell Murals, which engages high-risk kids in creating huge public wall murals--including some right in the neighborhood. Buy some great Gowanus inspired gift items at the Gowanus Souvenir Shop. One can buy pottery at the Porcelli Art Glass Studio or Claireware Pottery, African drums from long established Keur Djembe (568 Union Street), vintage guitars at RetroFret, (233 Butler Street), and bike gear at 718 Cyclery (254 3rd Ave). Stay tuned for more retail as the neighborhood evolves. Gowanus is in full transition, sprouting new restaurants and art venues, artisanal food companies nearby old auto repair shops-- and Whole Foods. Picturesque, it's the site of numerous photo shoots for ads and movies, too. You can go to a concert here, or rent a space for a private event. Or, just grab your camera and bike and go explore.